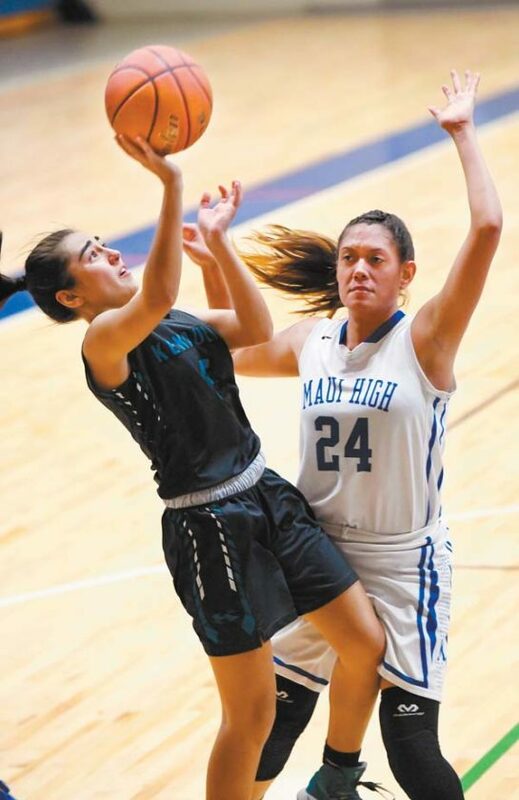 It has yet to be officially dedicated, but it hosted its first varsity action on Wednesday night as the King Kekaulike girls walked away with a 52-46 win over the Sabers in a Maui Interscholastic League Division I basketball game Wednesday. After trailing 24-23 at halftime, the Sabers took the lead 20 seconds into the third quarter on a drive to the basket by Neil Mae Bumanglag. Na Alii took the lead back 29-27 on an inbounds play that Temahh Shaw converted with 4 minutes, 55 seconds to go in the third quarter — the lead grew to 33-27 after an 8-0 run. Maui High’s Kristi Echiverri drives to the basket in the second quarter Wednesday. 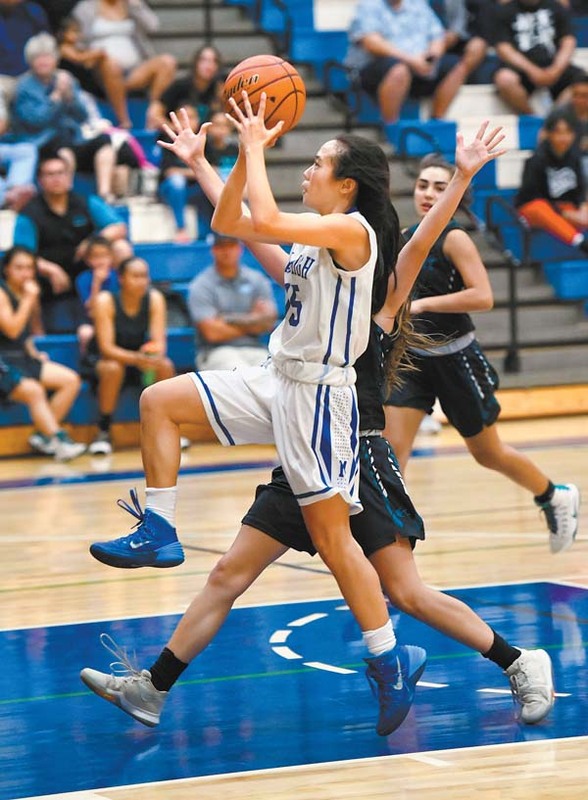 Honey Let Padasdao made a pair of free throws for the Sabers to cut their deficit to 48-46 with 1:26 to play, but Kuulei Araneta scored inside and Namahana Kaeo-Young added a breakaway layup to seal the win for King Kekaulike. Shaw and Kaeo-Young each scored 10 points to lead Na Alii (2-0). 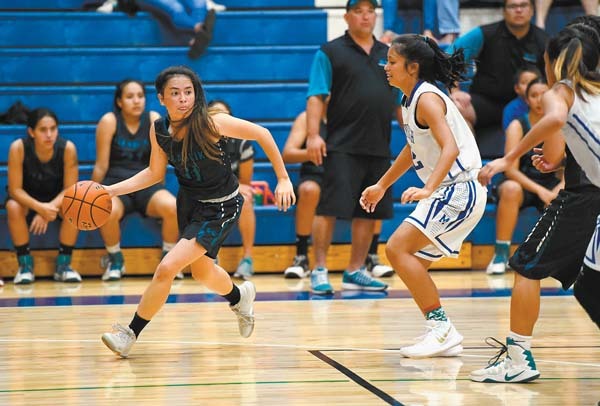 Last Friday, Maui High beat King Kekaulike in Na Alii’s preseason tournament. Padasdao finished with 15 points to lead the Sabers on Wednesday. The official dedication ceremony for the late Matsui will be a week from today at 4 p.m. in the gym itself — it is free and open to the public. There is no game that day, but the Maui High boys and girls teams will be practicing. King Kekaulike’s Namahana Kaeo-Young dribbles against the Sabers’ Kylenna Rieta in the first quarter. 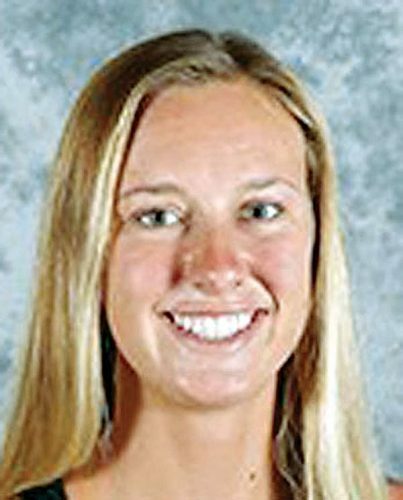 “It’s going to be a ceremony for the alumni, family of Shine Matsui and the Maui High community to come together and honor our past,” Sabers athletic director Mike Ban said. Matsui worked at Maui High for nearly three decades — as a teacher, football coach and athletic director — at both the old Hamakuapoko campus and the Kahului campus that opened in 1973. Cailyn Ukida 8, Charlie Abreu 6, Liane Tomita 9, Namahana Kaeo-Young 10, Daeja Callo-DePonte 0, Temahh Shaw 10, Tanisha Valdez 0, Kuulei Araneta 9. Honey Let Padasdao 15, Brianna Guzman-Kee Chong 9, Kylenna Rieta 2, Kristi Echiverri 2, Neil Mae Bumanglag 8, Kamaile Cugal 10, Mayghen Thornton 0. King Kekaulike vs. Lahainaluna at Lahaina Civic Center, 7:30 p.m.